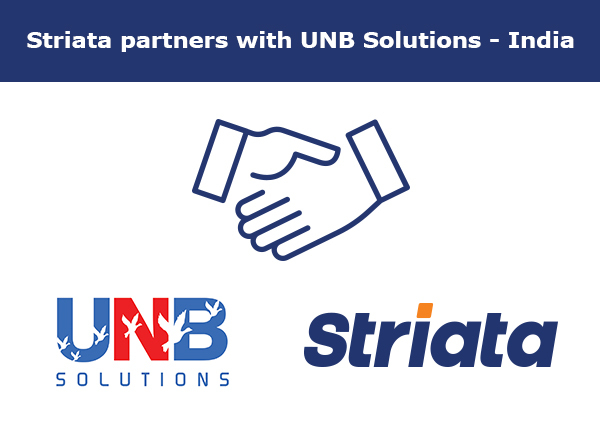 Striata has partnered with UNB solutions, India – a provider consulting, implementation, business transformation and operational solutions for clients across the globe. “We are delighted to welcome UNB Solutions as our partner in India. The addition of Striata’s secure document delivery to its solution set will provide breadth to UNB’s offerings, enhance its credibility in the CCM space, as well as give it a strong foothold in the eBilling market,” says Keith Russell, Director, Striata – Asia Pacific. UNB Solutions is dedicated to providing world-class technical expertise and business solutions that enable its clients to meet their business objectives faster and more cost effectively. “Striata will work closely with UNB Solutions to help drive its current and prospective clients in India toward digital customer communication solutions. This in turn will enable businesses to achieve the highest levels of efficiency, decreased costs, and an overall enhanced customer experience,” concludes Russell.